Fire fatalities burned an eye-opening statistic into Spartanburg County last year. As we enter 2015, a look back at 2014 reveals that the county significantly led the state with the highest number of people killed in fires. Fourteen people died in fires in 2014. There were just two in 2013 and another two in 2012. Not only did the county trump itself considerably, Spartanburg doubles the next highest county’s total. 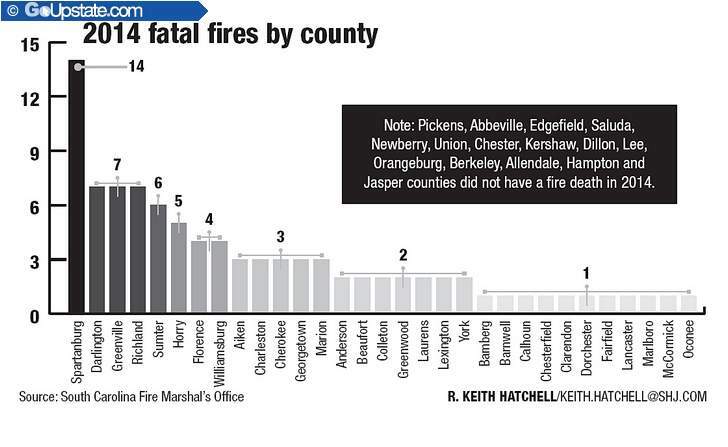 Greenville, Richland and Darlington counties came in at second and each had just seven fire fatalities. Several key fires last year were big contributors including a Dec. 20 apartment fire that claimed five lives. Officials are now perplexed at these grave numbers. I took a look at the data to see what can be done going forward.